The contact between water and bare metal leads to the formation of rust. If you do not act as soon as possible, rust will consume the metal. This is not only unsightly, but it is also going to compromise structural integrity. In most cars, if the damage is too much, you need to replace the sheet that has been damaged. If the problem is not that severe, it can still be saved. 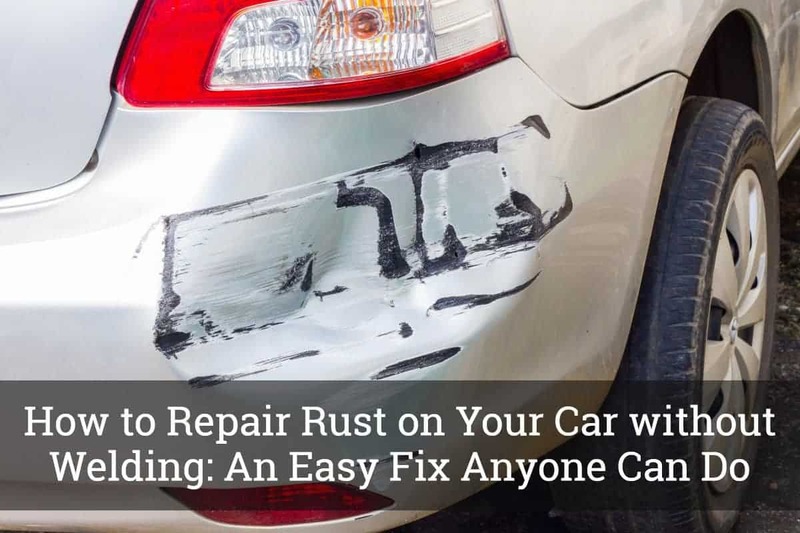 In the rest of this post, we will tackle the specific steps on how to repair rust on your car without welding. It might seem like a tricky job that is reserved to the experienced mechanics, but it is actually quite easy. All that you need is to have the right materials, as well as a little time and effort to spare for the task. As it will be shown in this section, there are four simple steps that you have to follow. They are pretty much basic and can be completed without the need to ask for a helping hand. It can help you save hundreds or even thousands of dollars! The first thing that you have to do is to take out the rust on the surface. To do this, use an adhesive remover spray. Apply liberally on the part that you have to treat. This will eliminate the wax dirt or oils on the surface, making sure that the metal underneath the rust will not be contaminated. Now, grab your sandpaper and start working on the rust. Use an 80-grit sandpaper. In case you do not know, if the grit number is smaller, this means that it is going to be more aggressive. If you want to apply more pressure, I also suggest that you use a sanding block. This is easier to hold. When doing this, see to it that you are wearing your dust mask. 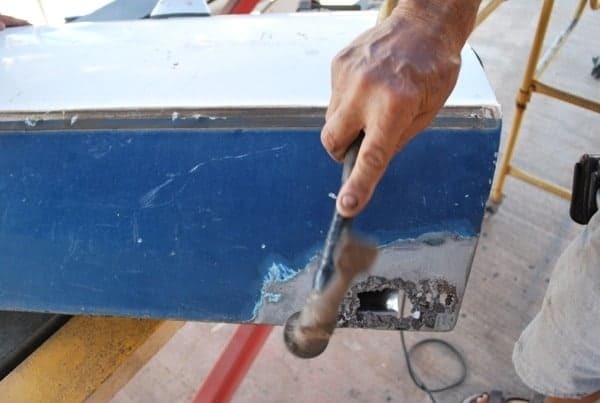 If the rusted part is near a portion that does not rust, remove it first. You won’t want to touch any part that does not have a problem. Remember, if there is rust on the outside, chances are, it is also rusted on the inside. Jack it up first and work on the inner part of the car to remove the rust as well. Once you are finished sanding, the next thing that needs to be done is to add a filler. But before doing this, hammer the area that you have sanded. This is going to flatten the surface, making it easy to be filled. This is also going to make the panel stronger. Apply a rust reformer to deal with any rust that you might not have removed from sanding. It provides a chemical bonding that will make the surface paintable. Apply an undercoating afterward. Use a body patch to fill the holes. As shown in the video above, for this guide, we have used a ﻿﻿stainless steel mesh. Place it behind the body panel, which will provide the support needed by the filler. Apply an adhesive remover to clean the area. Now that the area is clean, you can proceed with applying body filler. Here, we are going to use a body filler that is infused with fiberglass. Gold body filler is also used. Mix filler and hardener. Follow the instructions from the manufacturer to be sure that you are doing this the right way. Apply a layer of filler on the surface. You do not need to make it perfect since the first filler is basically just for strength. Apply the gold filler. Here, you need to be more careful to be sure that it is going to end up smooth. Provide the filler with enough time to dry. Once it has dried, you can now proceed to sand. Sand not only the surface, but also the edges. Start with an 80-grit sandpaper and eventually, transition into a 180-grit sandpaper, which is finer and less aggressive. This is going to smoothen the surface and make it blend well with the other part. Touch the surface that you have sanded. If you can feel bumps, this means that you still have to keep on sanding until it is finally smooth. Wipe it down and blow any dust before you proceed. Once the surface is sanded and smooth, you can now go to the next step, which is painting. This is crucial as it is going to restore the original look of the part that was once damaged. Be sure to look for a paint that matches the color of the rest of your car. Start with the application of a primer. Let the primer dry and start painting. This can be quite challenging, which is why some people opt to bring their car to a paint shop. This won’t cost too much at all since you have already done the initial work. Once it is painted, your car will end up looking good without any sign of rust! Treat the rust as soon as possible, while it is still small. The longer you wait, the larger the damage will be and the more difficult it would be to treat. Do not focus only on the front part of the car. Treat the back part as well. Otherwise, rust will just spread and your effort will be wasted. To prevent your vehicle from rusting, a regular wash is important. Use a pipe cleaner to clean rainwater. Salt, grime, and dirt can speed up the process of rusting, so get rid of them! When the rust problem is severe, do not try to have it saved. Instead, opt for replacing the entire part as this is a more viable solution. By now, I hope that you are already aware of how to repair rust on your car without welding. As shown above, there are basically four steps – remove, fill, sand, and paint. It is an easy job that can be done by almost anyone. No need to spend a fortune to make your car look good!